It would be better if we make the filling first and keep it to cool. Cook chicken in a kadai by adding 1/4 Tsp turmeric ,1 Tsp red chilly powder and salt with sufficient amount of water.Let it cook on a low flame till the meat is soft and all the water is absorbed. Cool it down and crush the cooked chicken in a chopper/food processor and keep aside. 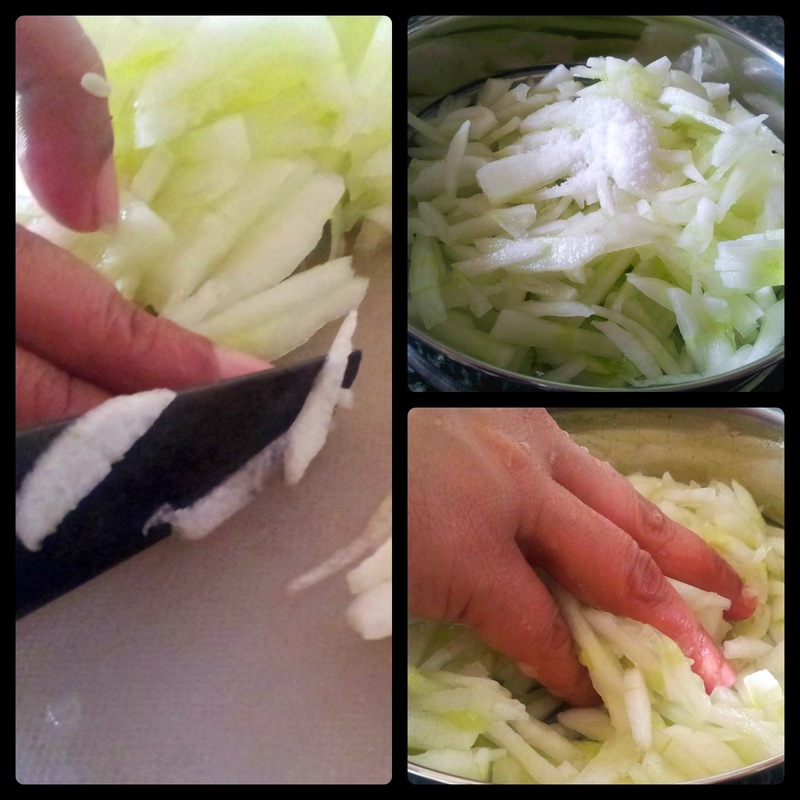 Heat 3 Tbsp of oil in a pan, add finely chopped onion and saute till onion turns pink to light brown . Add ginger-garlic paste and green chilly. Saute till the raw smells leaves. Now add 1/ Tsp turmeric powder, 3 Tsp red chilly powder, and and pepper powder . Saute for 2-4 minutes. Now add crushed chicken,garam masala and fennel seeds to it. Saute till the masala becomes dry and the colour changes to dark brown. Allow this to cool down well before filling. 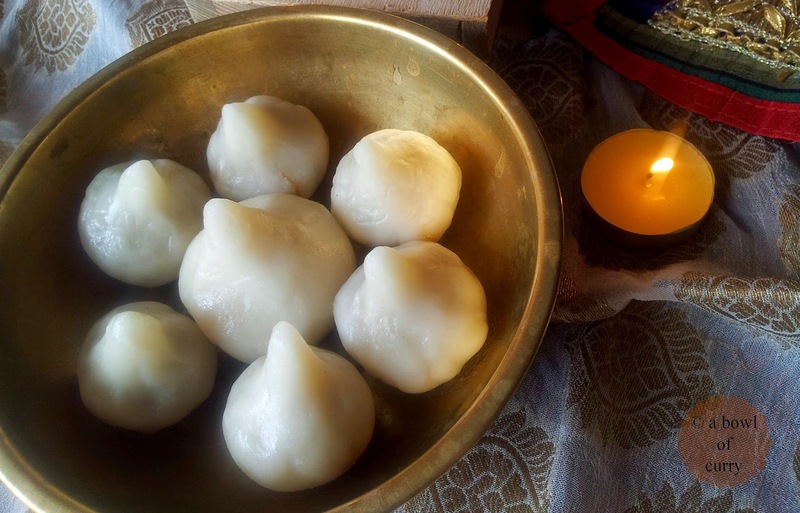 Make a dough of the maida, salt and water. Keep it as you do for poori's or chapathi's. The dough shouldn't be too soft. 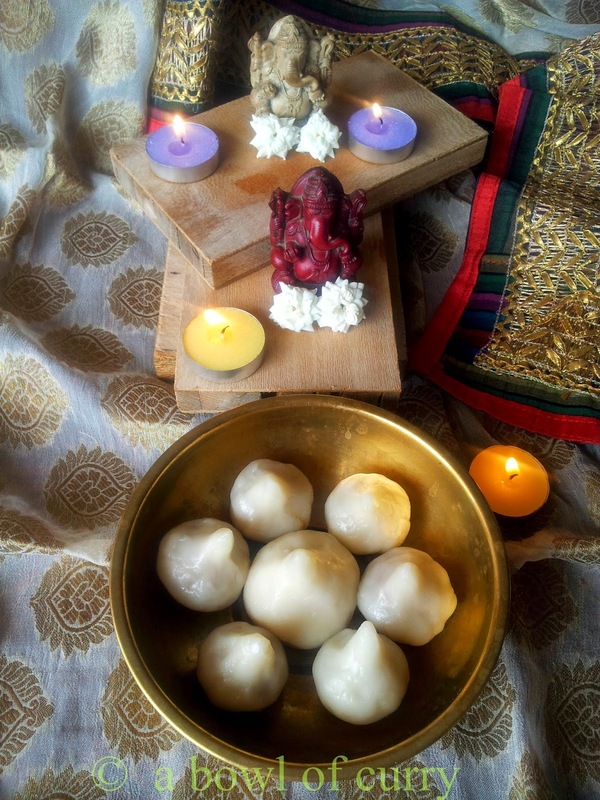 Keep it covered for 10 minutes and pinch out balls as you do for chapathi/poori. Flatten them using a rolling pin. 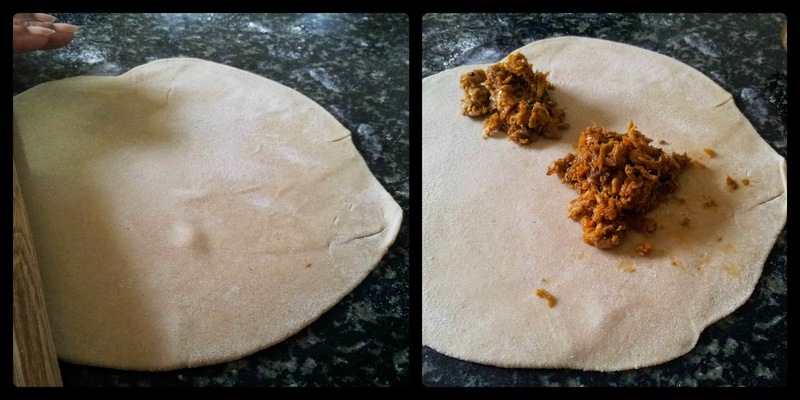 Fill in the prepared masala, as shown in the pics. Cover and seal all the sides properly, cut it using a pizza cutter or a knife or any cutter shapes you have. 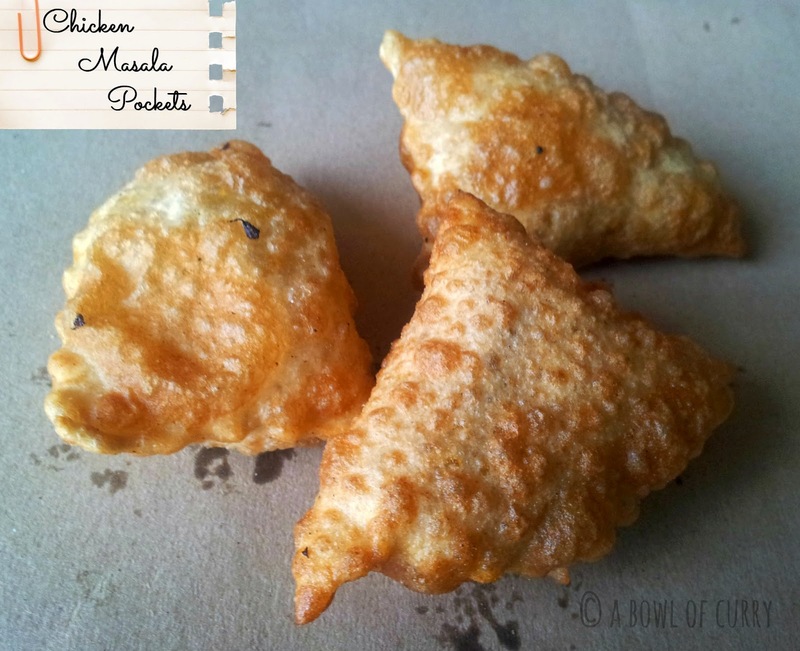 Deep fry them on both the sides until golden brown. Serve hot with ketchup or just as it is with your evening tea/ coffee. 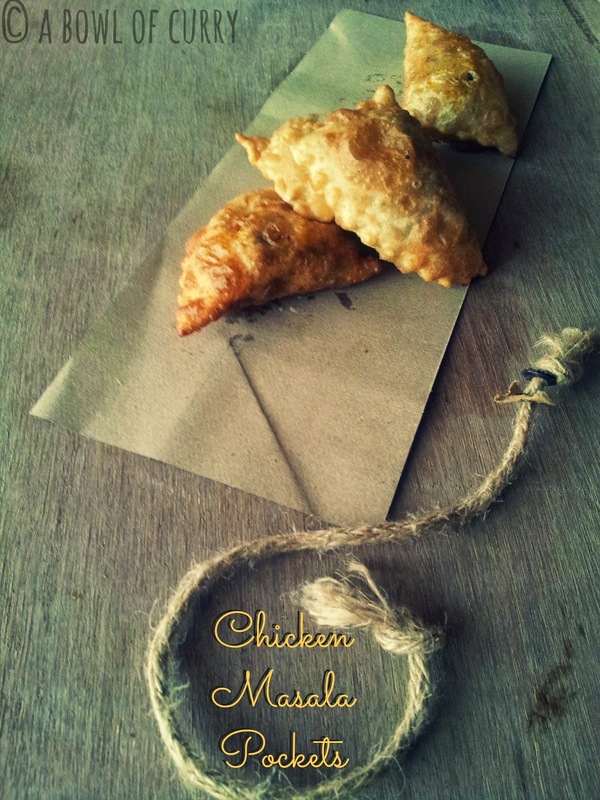 Chicken Masala Pockets ready... Enjoy!!! 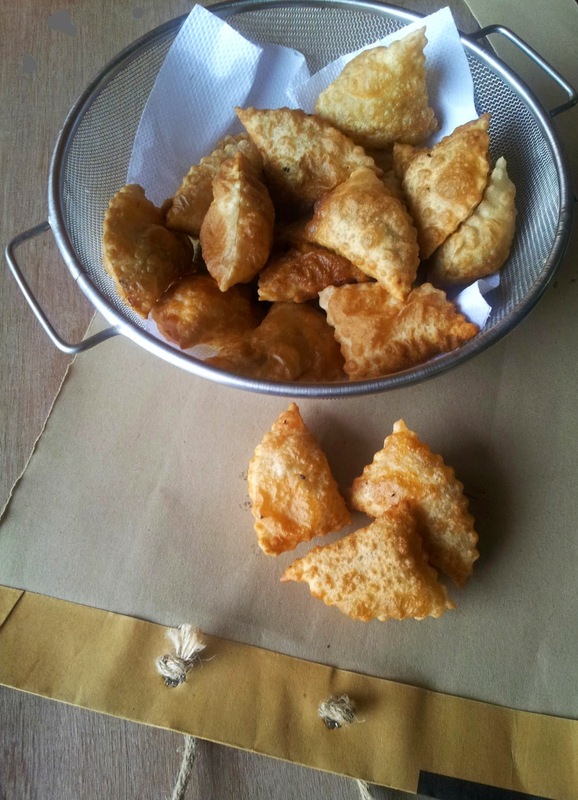 If you wish you can use only wheat flour for making the dough or may use half maida and half wheat flour. 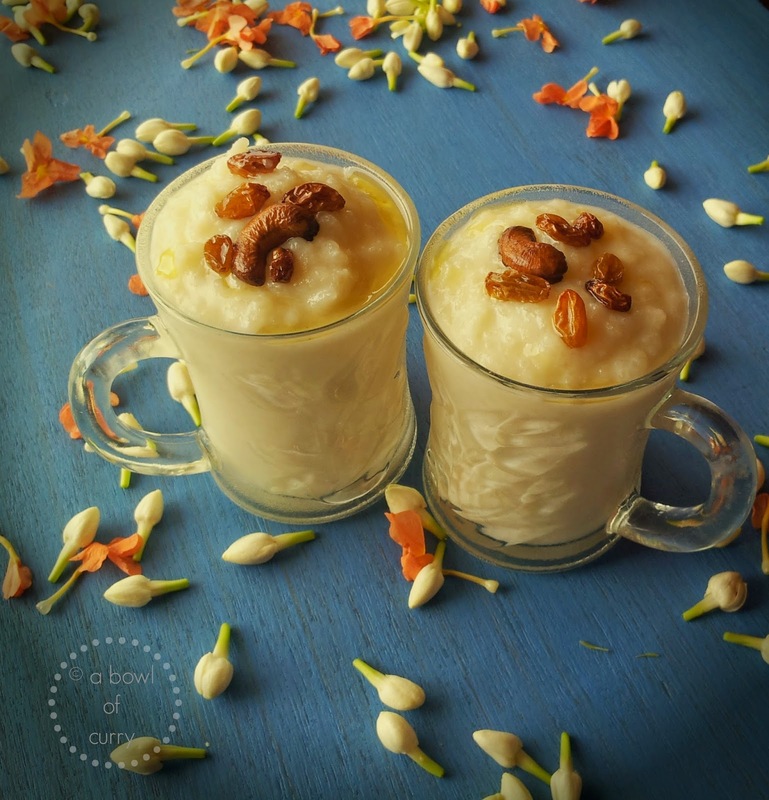 Doing a guest post for blogger who happens to be a very very special virtual friend is rather more happy , celebrating than interesting.So this is also a proud moment for me of being a A Guest at Rafeeda of The Big Sweet Tooth. 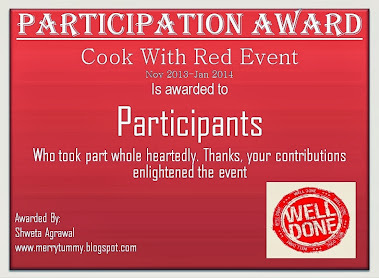 My friendship with her all happened through her happy and inspiring comments on my blog..I know you all might have got the same experience.She is a very warm and wonderful person.I really wonders at this young age how she manages all the work as wife, mother, as home maker and of course blogger. She takes her time to leave her valuable comments in each blogger's space she visits. I was amazed by the way she writes and understand each quotes from Quran, or any other, and she connects each with our emotions and daily life... when i read those, it leaves a thought in my mind..It is a pleasure to know you Rafee and i am glad to do this guest post and thank you so much for giving me this opportunity. 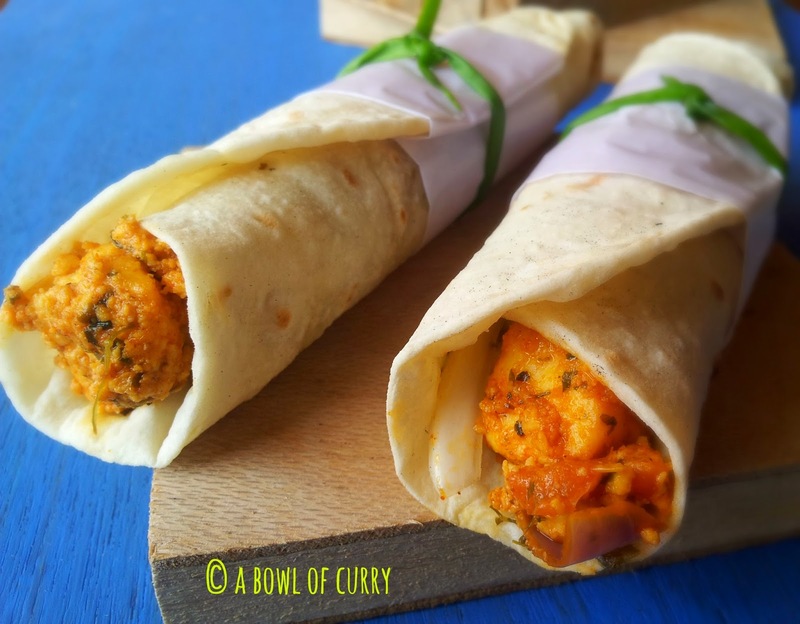 And today as her guest i have prepared Paneer Wraps, which is a hit at home now.....a lovely recipe.....a very mild but a very filling snack you can call it. 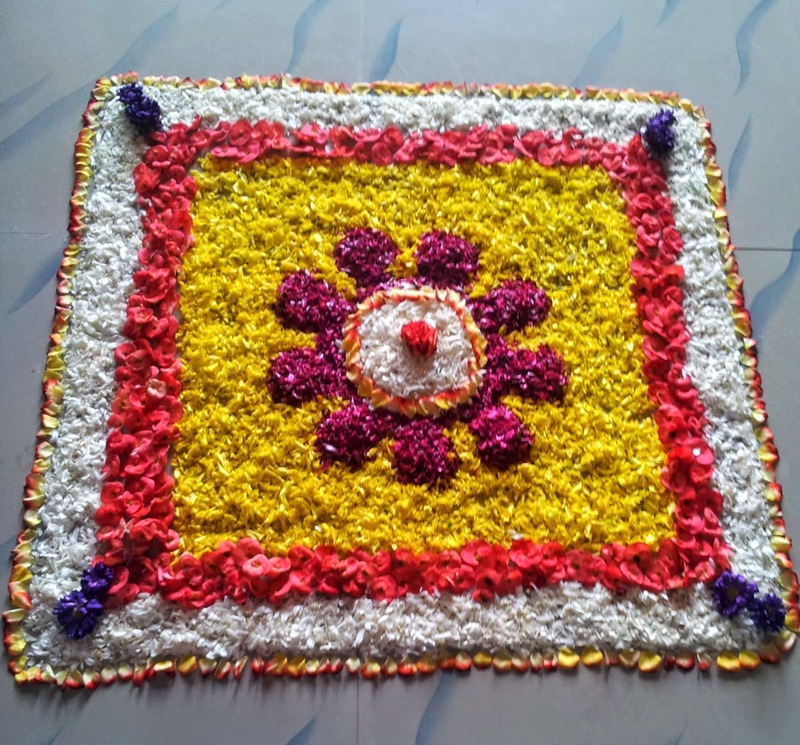 I have prepared a simple Onam Sadya also we made pookalam at home. Wash and drain water from rice. In a pressure cooker, add rice and water. Cook for 4 whistles on medium flame. Once done off the flame and allow the pressure to release.Transfer this to a bowl. In the same cooker boil milk and cook on low flame.Let it reduce to 1 liter. Add sugar and mix well until sugar dissolves.Add the cooked rice and mix well. If lumps are there just mash it using a spoon. Now add cardamom powder. Switch off the flame and remove from fire. 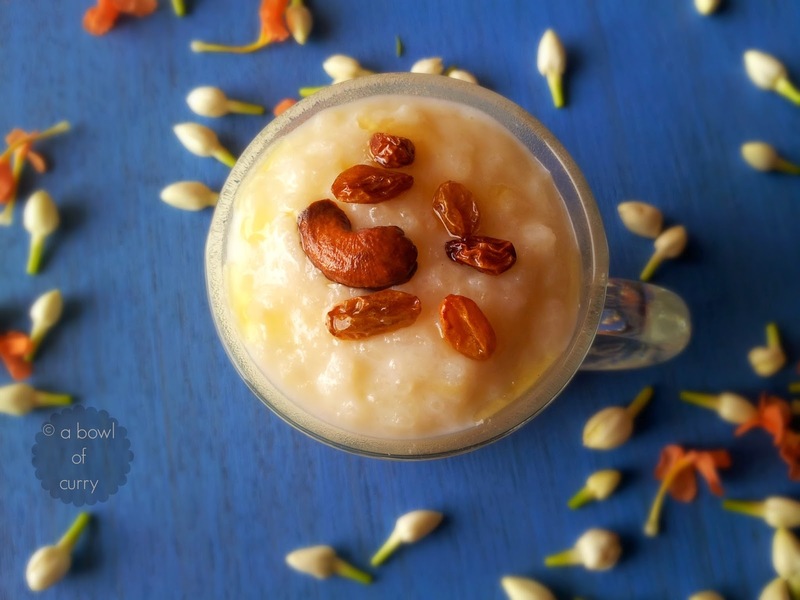 Heat ghee in a pan , fry cashew nuts and raisins till golden brown. Pour this on to paayasam and mix well. 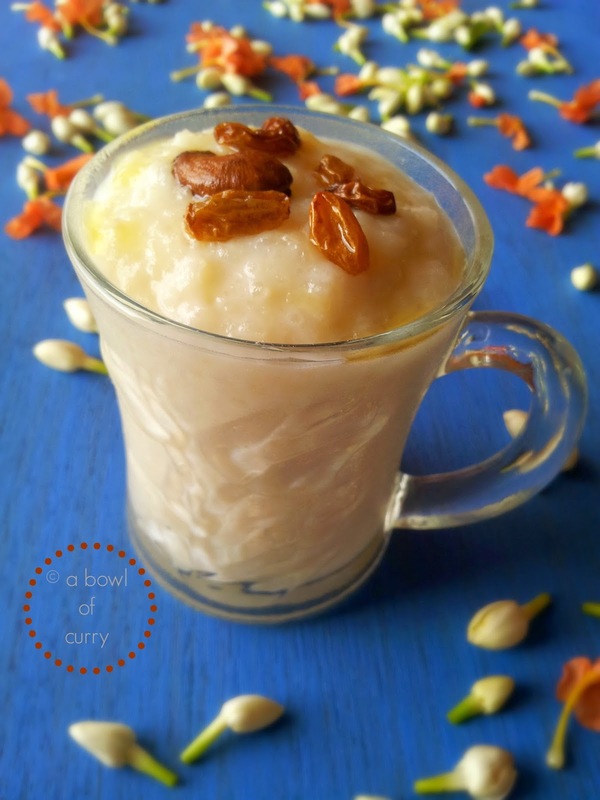 The payasam thickens with time so switch it off accordingly. Addition of cardamom powder is optional. 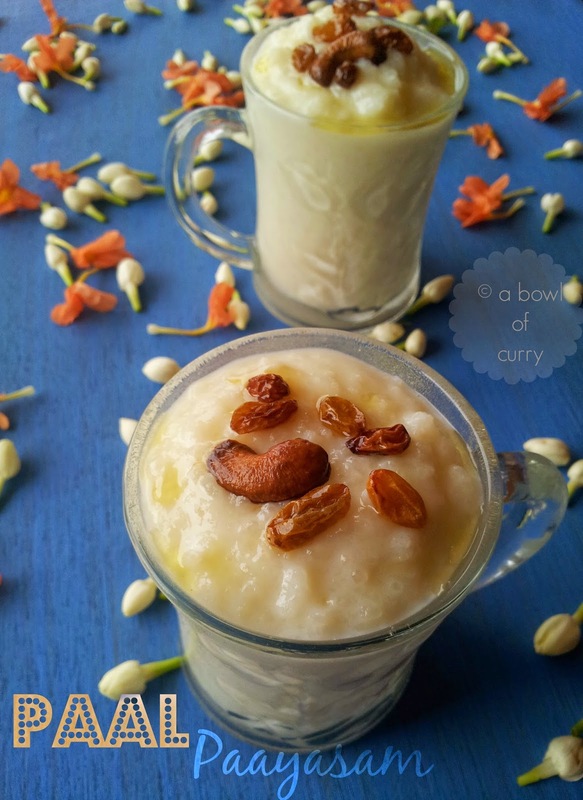 Also tempering cashew nuts and raisins in ghee is optional. You can directly add it. 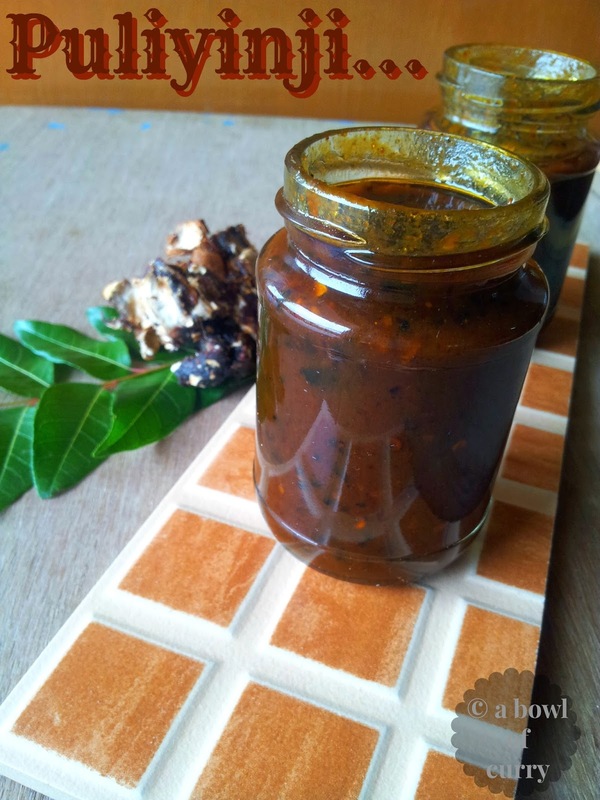 Puli Inji, a sweet and sour pickle or sauce in an essential finger-licking side dish served as part of Kerala Sadya.This is a sweet and sour ginger pickle from Kerala where ginger is cooked in a sweet and tangy tamarind sauce.Though there are many side dishes prepared for sadya like avialy, Kootu Curry, Kaalan, Olan, Saambhar,pickle,etc... no sadya is served without puliy inji.This is the first dish which i will prepare a week before Onam comes....The first lick on this tangy sauce makes your taste buds stand up and enjoy your meal.This is awesome.Each home it is prepared in differently fried ginger , tamarind and jaggery being the stars of this dish. This comes in the category of 'thodu curry's. 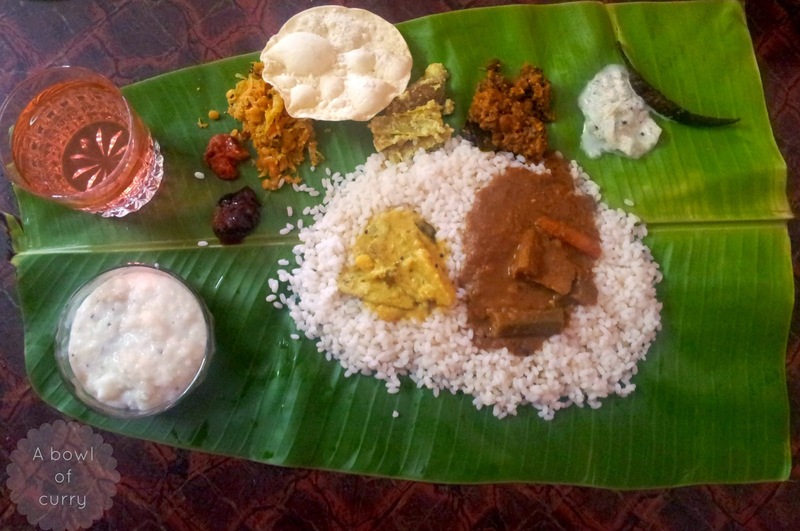 So do prepare this to have a complete authentic meal from Kerala. Heat an earthen pot / non- stick sauce pan (not iron pan), add coconut oil,splutter mustard seeds, then add dry red chilli and 1 sprig of curry leaves . Add green chilli and sliced ginger and fry nicely to golden brown. Keep aside. 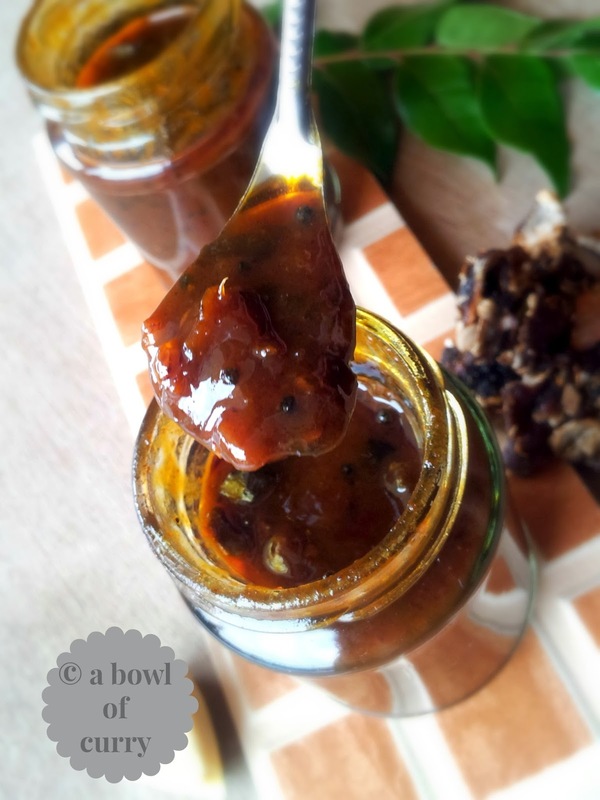 Squeeze the soaked tamarind,extract the juice and keep aside. 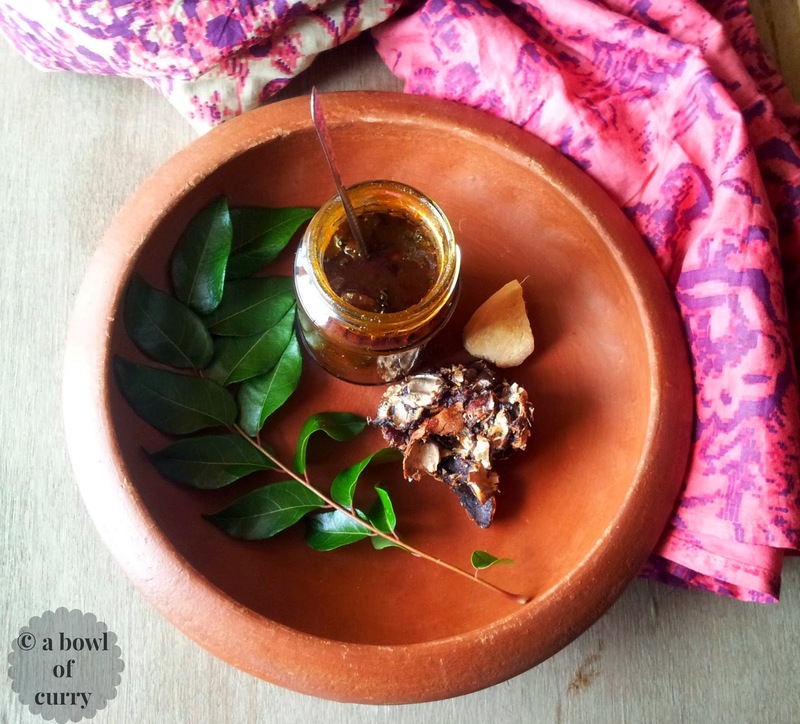 In the same pot/pan add grated jaggery, tamarind extract, water, turmeric powder, red chilli powder, asafoetida,1 sprig of curry leaves and salt. Mix well. Let it boil and cook on low flame,till the gravy thickens and reduce to pulpy texture. Now add the fried ginger mix, kept aside and mix well and remove from heat. Heat a pan, add fenugreek seeds and dry roast it. Immediately powder it using a mortar. Add this to the prepared tangy sauce. Mix well. Let it cool and reach room temperature before store it in air tight container. You can serve it after one hour of preparation. If stored properly will last for 3 weeks. 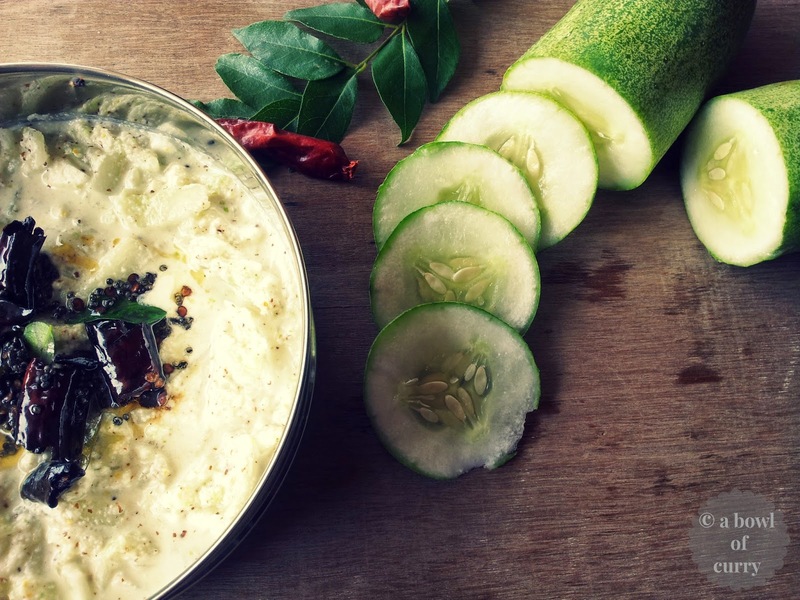 Cucumber(Kakkarikka) Pachadi is an authentic Kerala festive recipe, made during the festive seasons of Onam,Vishu and even served for wedding sadya's in Kerala. 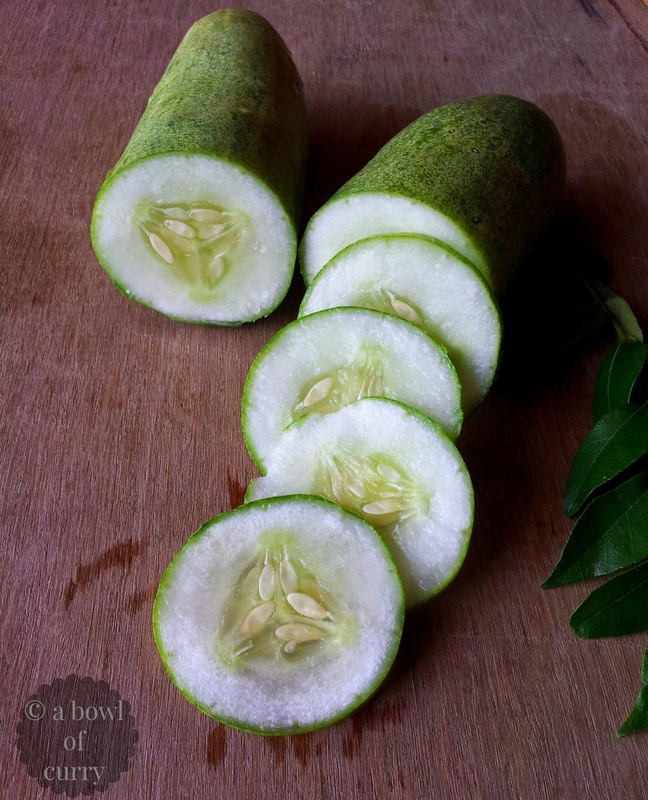 Wash and peel the skin of cucumber.Grate it to fine shreds as shown in figure. Add some salt and mix well. Keep for 5 minutes. 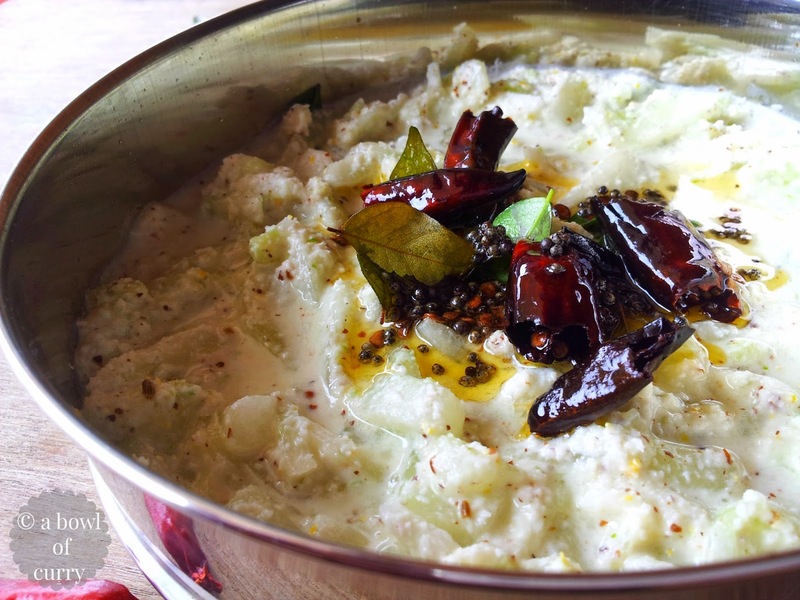 In a mixer grind to a smooth paste of coconut, green chilli, ginger,mustard seeds. Add in yogurt and mix well. 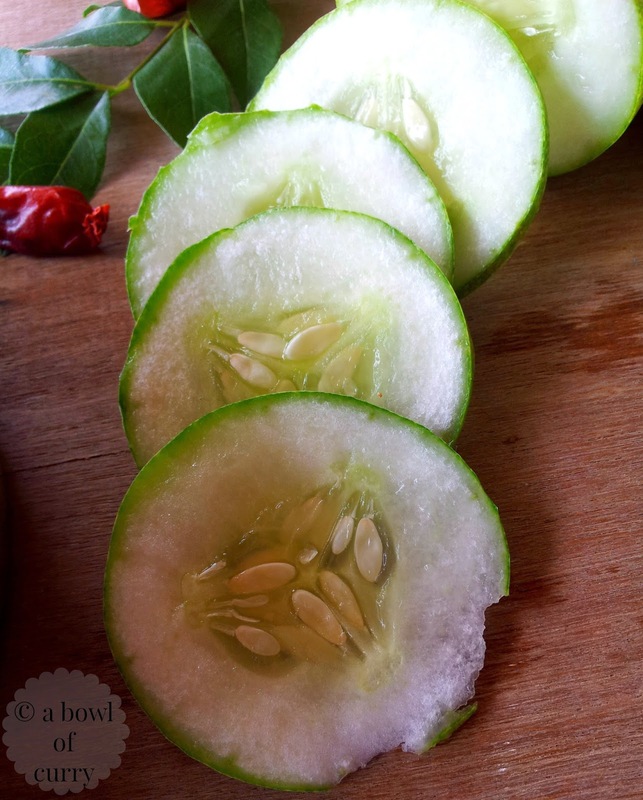 Drain the salt water from shredded cucumber and add the coconut - yogurt paste. Mix well. Sprinkle jeera powder and curry leaves , mix properly. The pachadi should be quite thick and not watery. 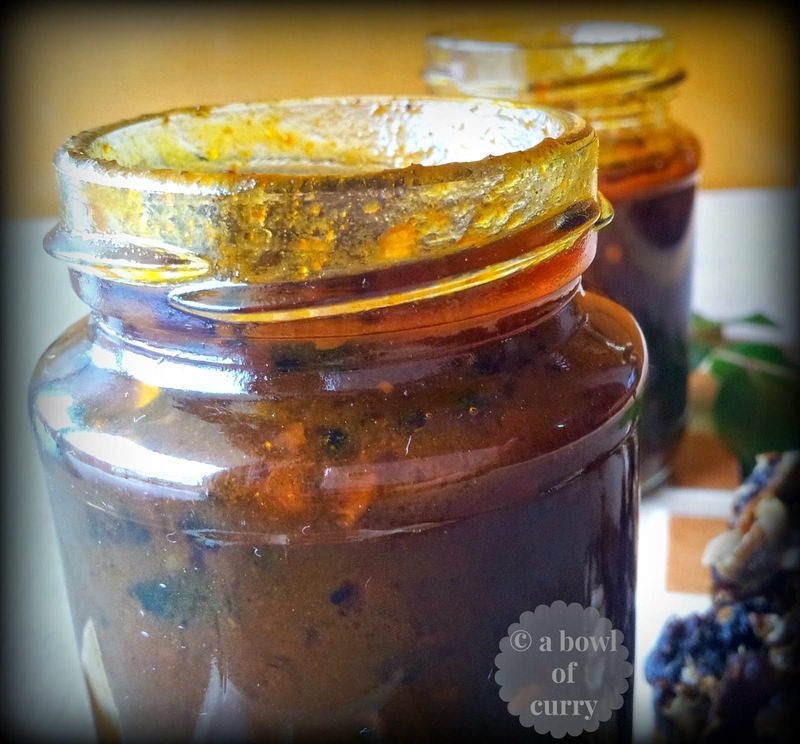 Heat oil to temper, add in mustard seeds, let it crackle and dry red chillies, curry leaves. 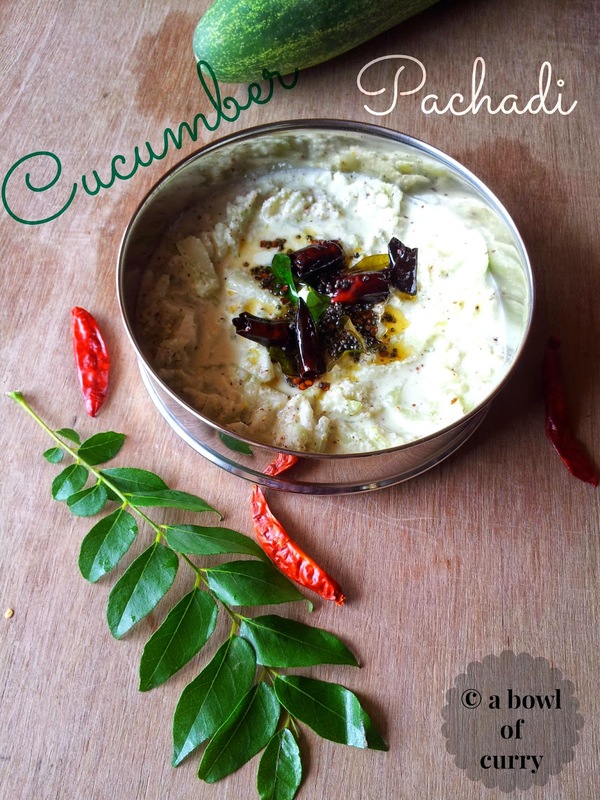 Pour this onto the pachadi. Serve as a side dish for rice at lunch. 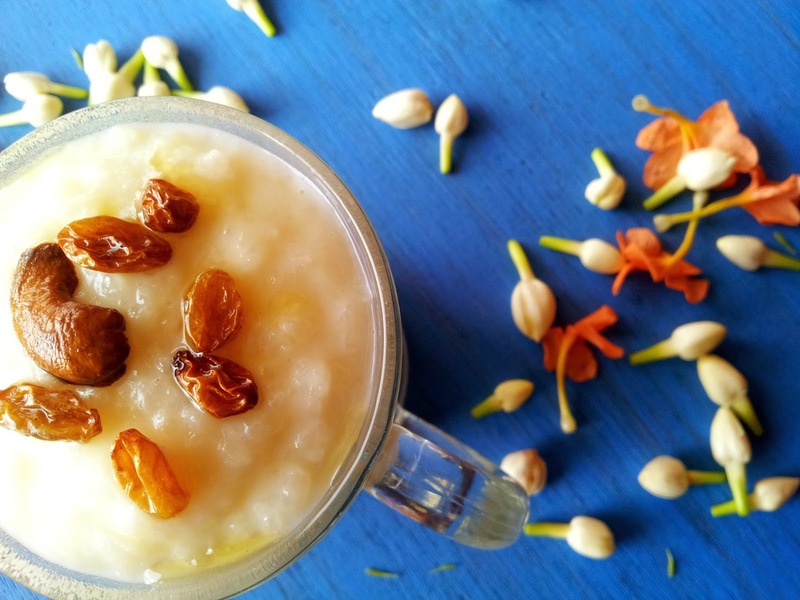 Pachadi is one of the special traditional side dishes that is served during festivals , especially )Onam ,Vishu and also during Hindu marriages.The use of vegetables and even fruits vary so much and also in their taste. 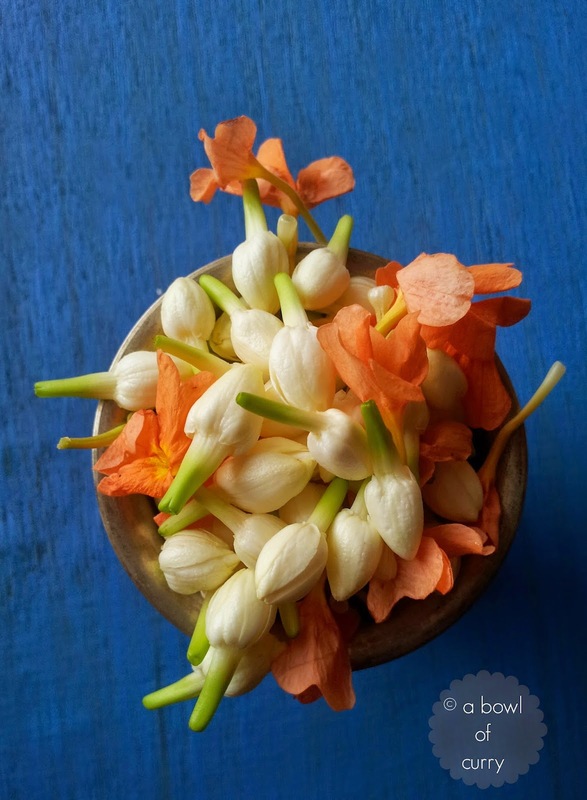 The main ingredient being freshly grated coconut ground to smooth paste along with ginger, green chillies, and mustard seeds and yogurt and is mixed with variety of raw or cooked vegetables. 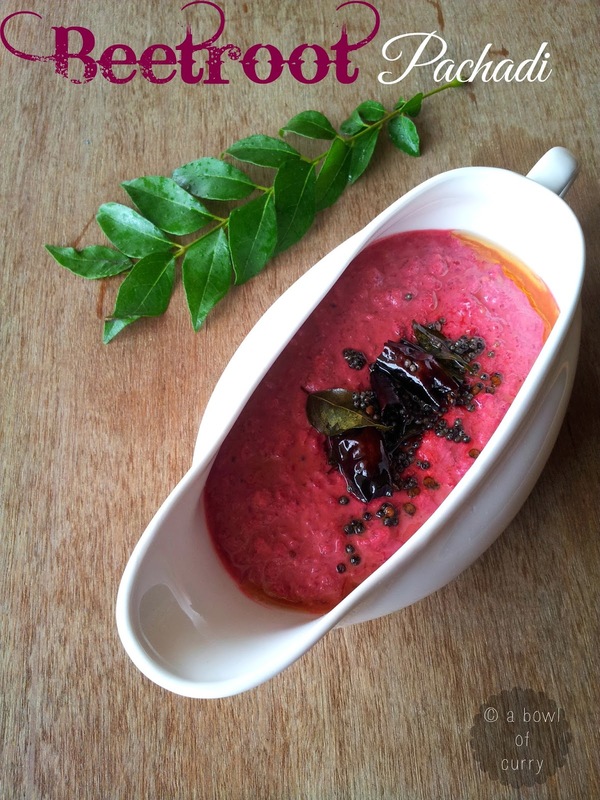 Today i made Beetroot Pachadi , which is a bit sweet in taste. 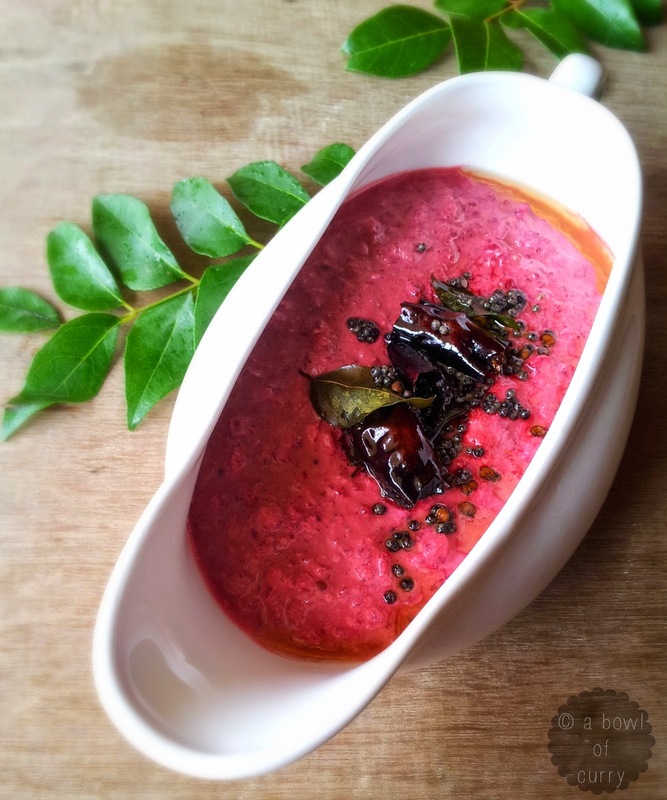 This was on my list from quite sometime.The final verdict from my family was "Delicious", i loved the rich colour that Pachadi had was truly amazing to have with rice. 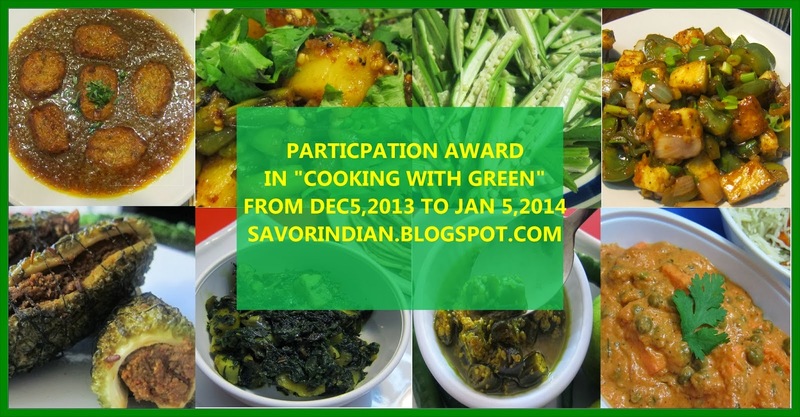 Meanwhile grind the grated coconut, green chilli, mustard seeds and ginger to a smooth paste. Add in yogurt and grind just once. 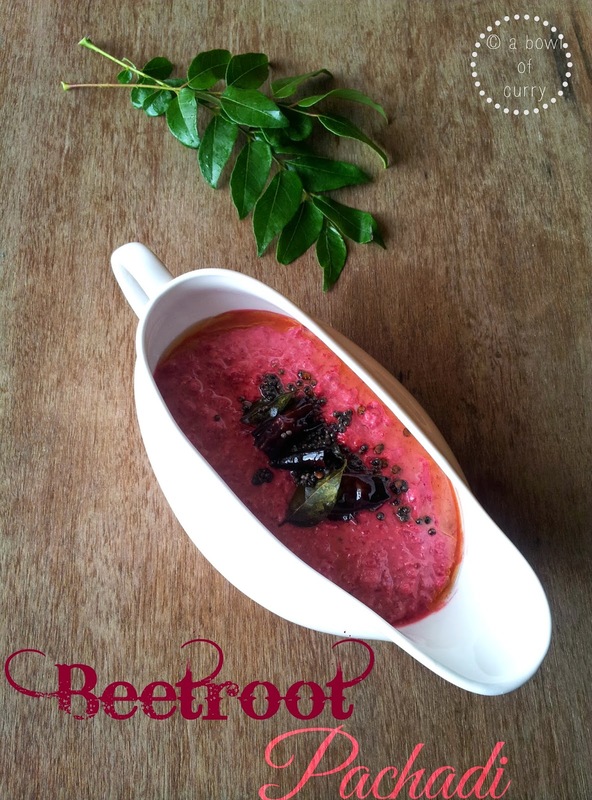 Add this grind paste to the cooked beetroot, also add salt and cook for a couple of minutes. (i cooked for 1 minute on sim flame).Remove from flame. 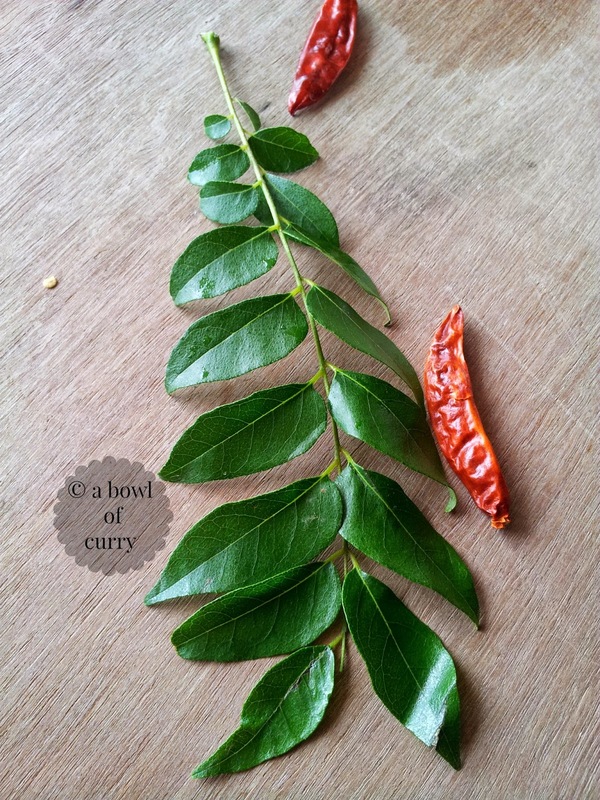 Heat oil for tempering, add curry leaves and mustard seeds. When mustard seeds starts to sizzle and pop add the dry red chilli halves into it. 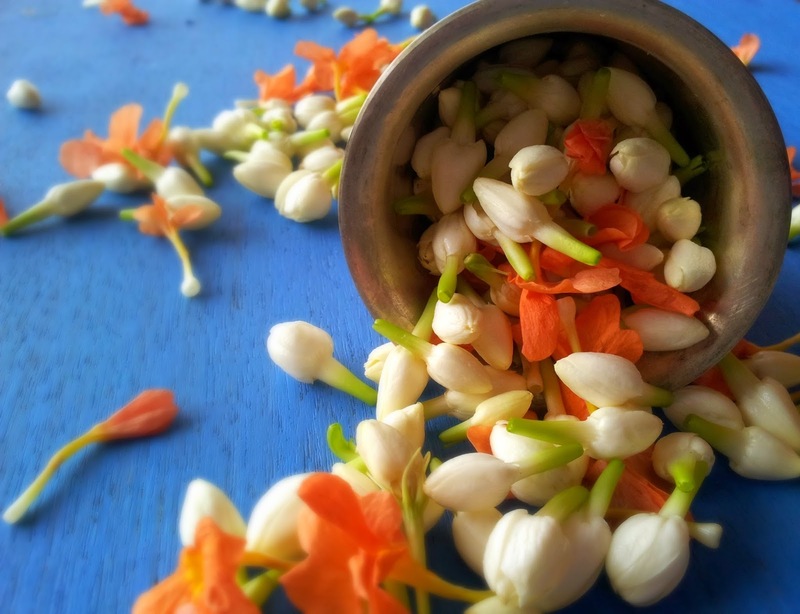 Pour this on to the pachadi and mix well. Whenever i see others posting this recipe , i feel very tempted. 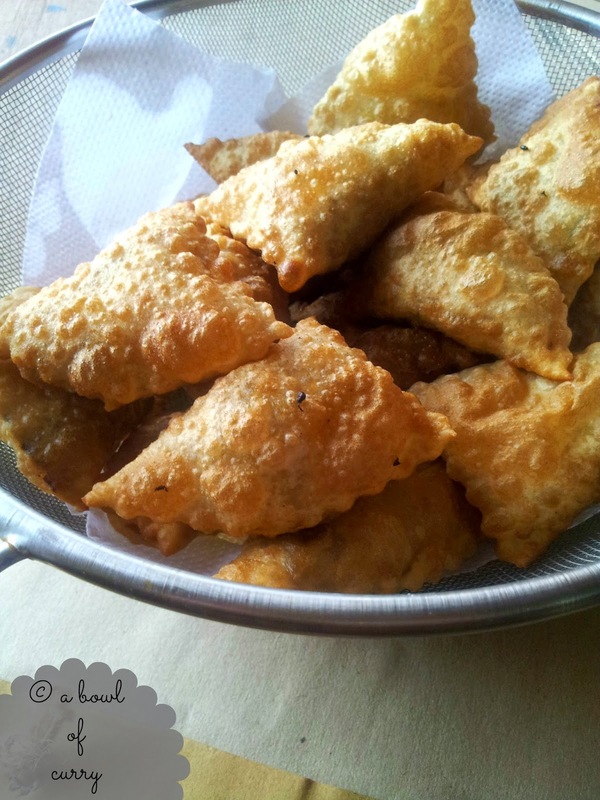 Before when i used to see them displayed in bakery's i used to think how are they folding and filling inside it. They used to be really perfect to see and very tasty. 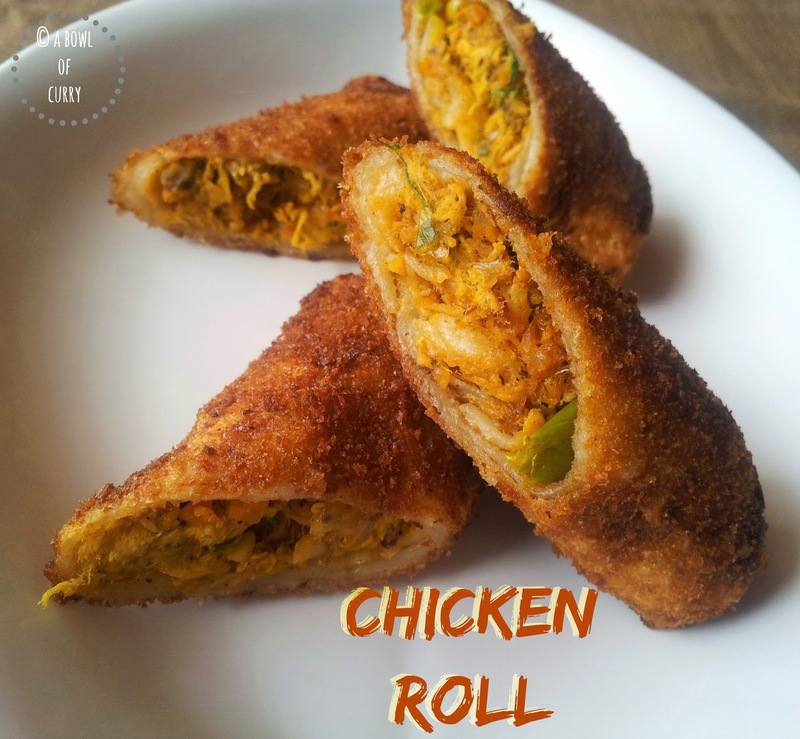 I feel this kind of rolls are tastily made in Kerala (:D). 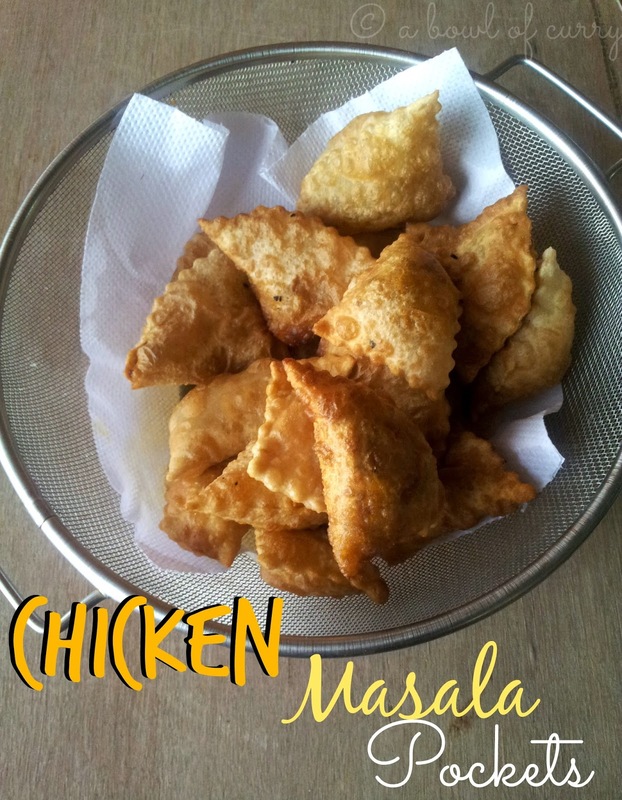 I used to also buy and have it at home , my kids just love those.So they were like when is our home chef going to try these. So when all things were ready in my kitchen, i made and surprised my family and they were very happy. I served them for tea and got vanished just like that....i saw them licking the sauce later and they said "while making these you should make lots...hehhee....". 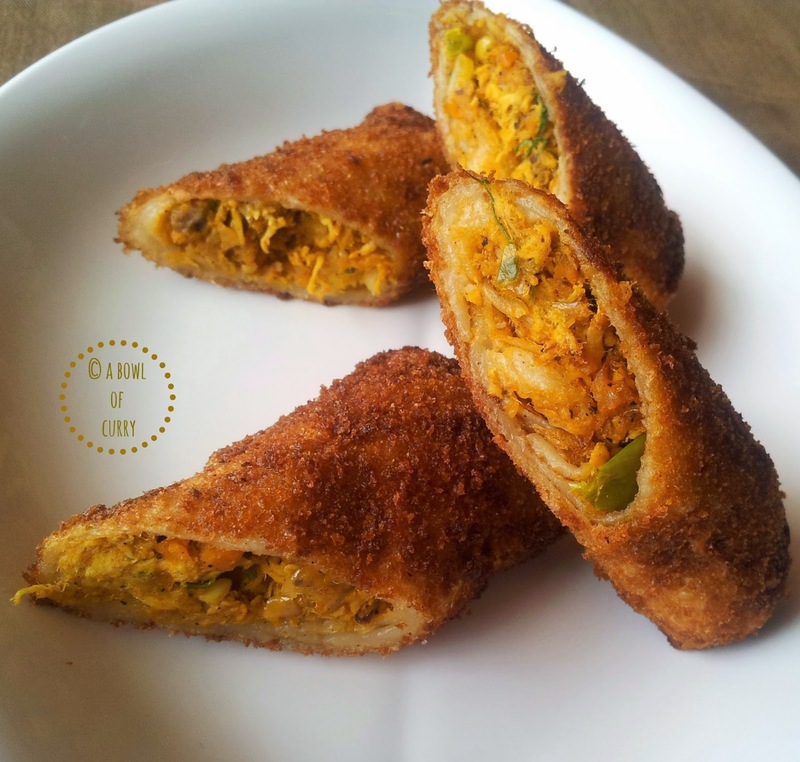 I was satisfied...it is a very good snack for parties and small get together's... I enjoyed , hope you will also enjoy these..
Cook chicken in a kadai by adding 1/4 Tsp turmeric & 1 Tsp red chilly powder and salt with sufficient amount of water.Let it cook on a low flame till the meat is soft and all the water is absorbed. Cool it down and crush the cooked chicken in a chopper/food processor and keep aside. Make a thin batter as for making a usual pancake batter. Heat a non-stick frying pan or tawa and make pancakes. Take a pancake. 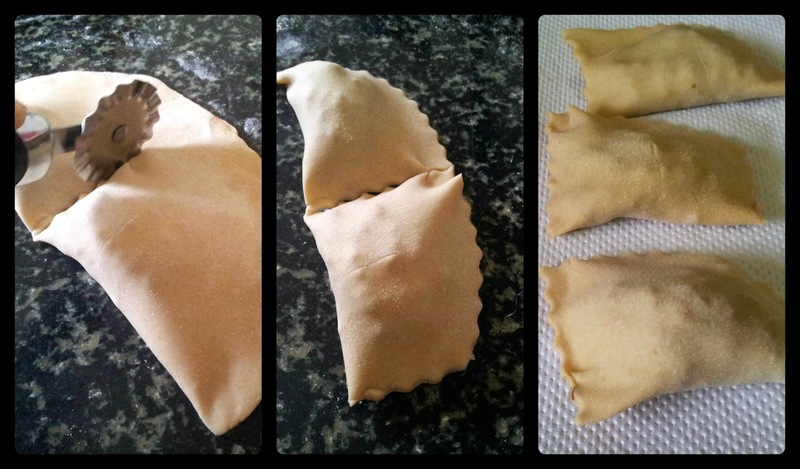 Place 1 Tbsp of the filling and fold from the sides and roll it. Stick the sides with the maida paste made with maida and water. Arrange all the rolls. 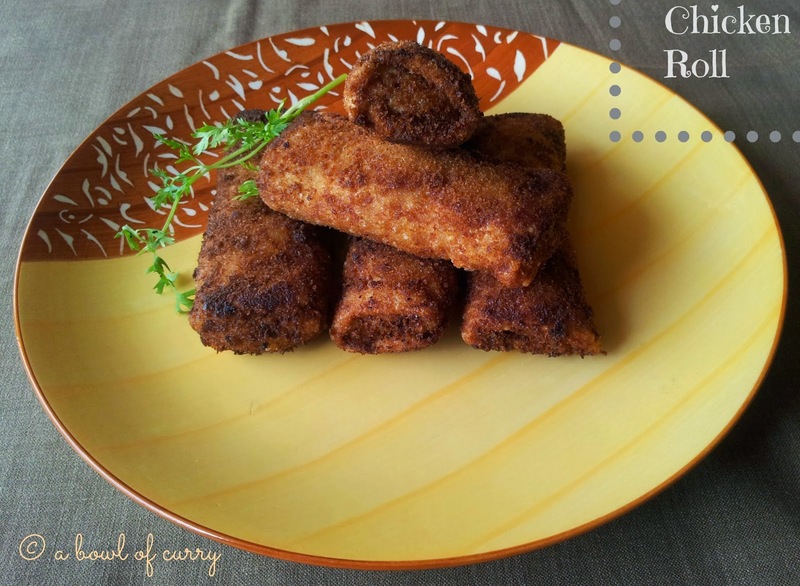 Dip each rolls in the beaten eggs, and roll in the bread crumbs very carefully. Heat oil for deep frying and when hot, make the flame to medium. Now deep fry each of the rolls to golden brown. 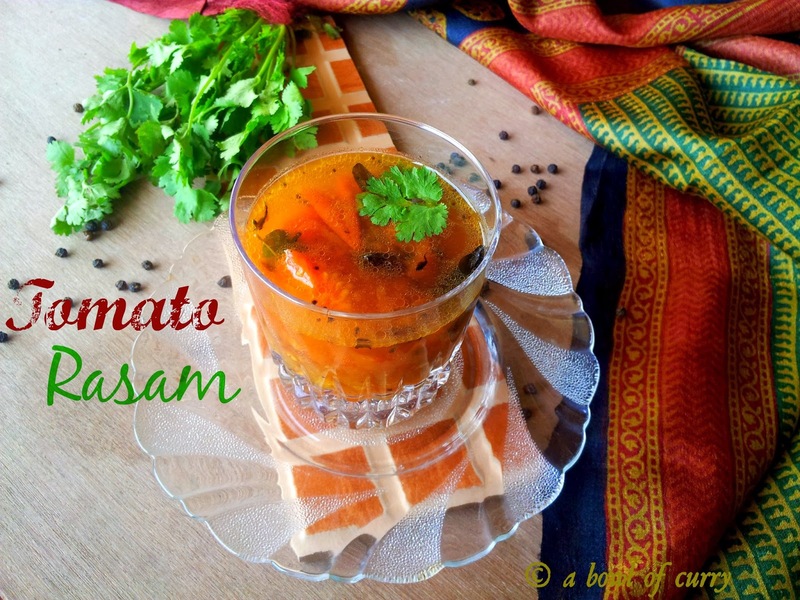 Serve hot with tomato ketchup or any dip you wish. Do not make the pancake batter too loose, as later they might become hard. 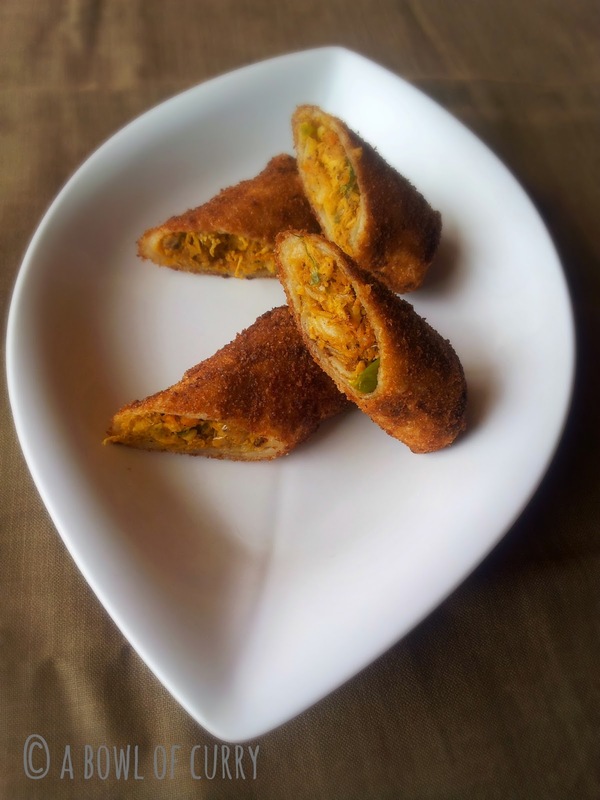 Adjust pepper powder accordingly for the masala filling. Make sure the masala is cool enough. Seal the sides proper;y, otherwise there is a chance for the masala to pop out. 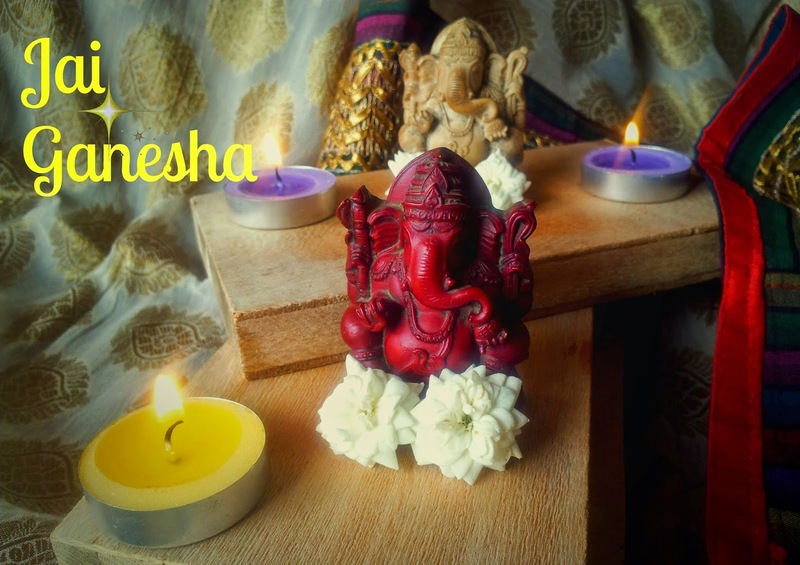 Ganesha Chaturthi is the Hindu festival celebrated in honour of the god Ganesha,the god of beginnings and wisdom.The festival, also known as Vinayaka Chaturthi. 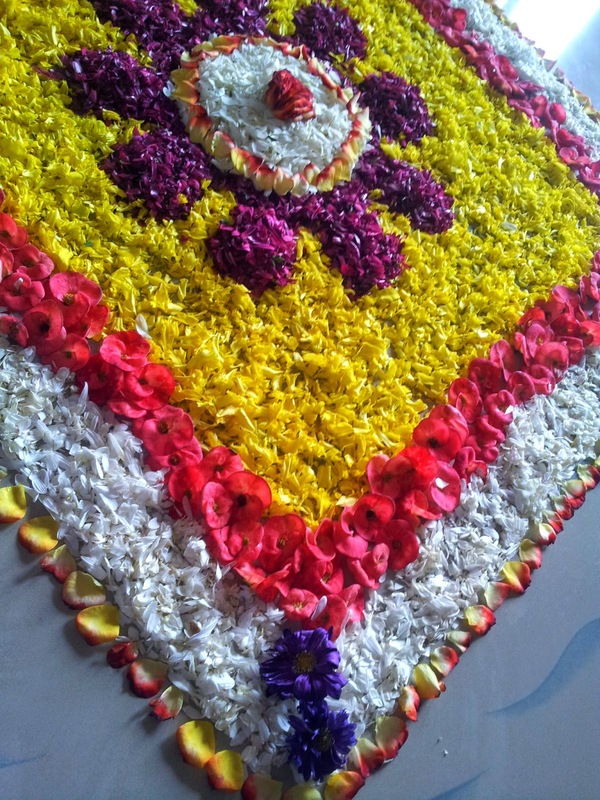 The festival lasts for 10 days, ending on Ananta Chaturdashi. 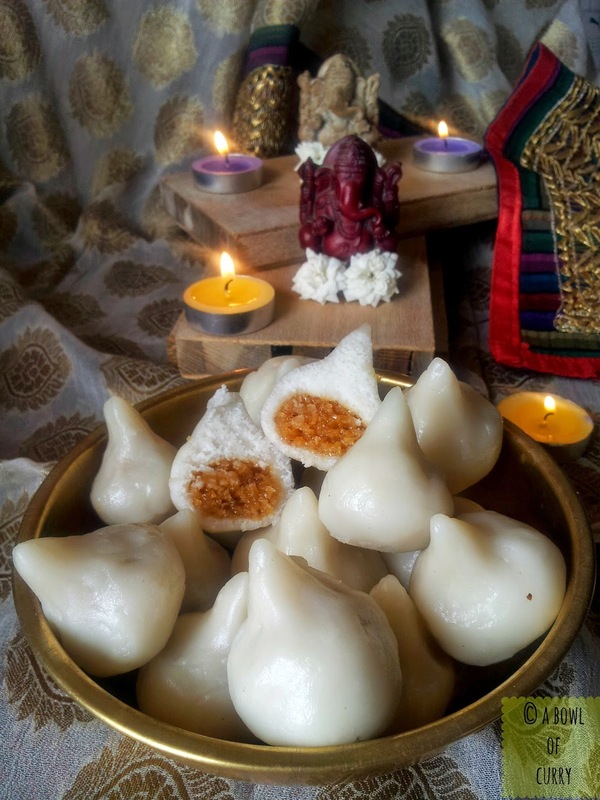 The main sweet dish during the festival is the modak, a dumpling made from rice flour with a stuffing of fresh grated coconut, jaggery, dry fruits and some other condiments. 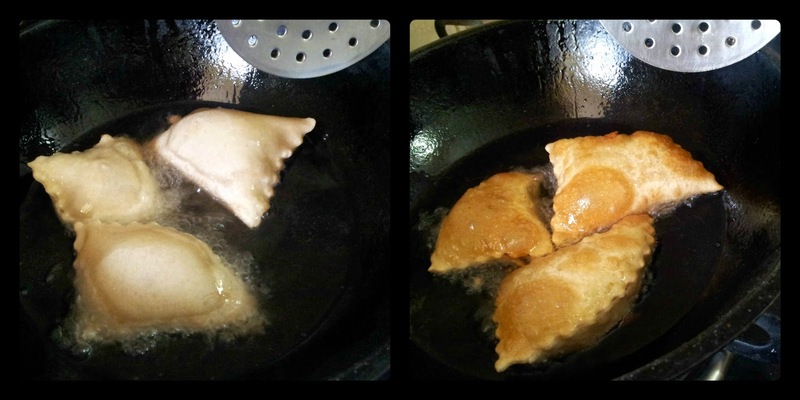 It is either steam-cooked or fried.I am making this for the first as for Ganesh chathurthi...Here goes the recipe. For the dough, add sesame oil to the dough. Add salt to boiling water and mix well using a wooden spatula. Make a smooth and soft dough. Keep covered. You can make equal sized balls and keep covered. 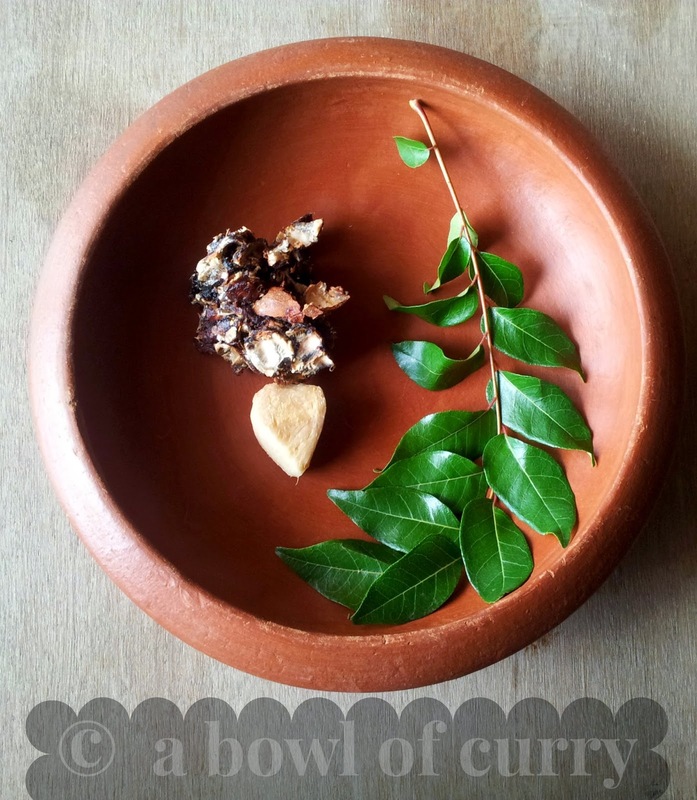 For the thenga pooranam, place grated coconut jaggery and elachi powder in a pan, with little of water. Cook on medium flame until, it starts leaving the sides of pan, switch off the flame. 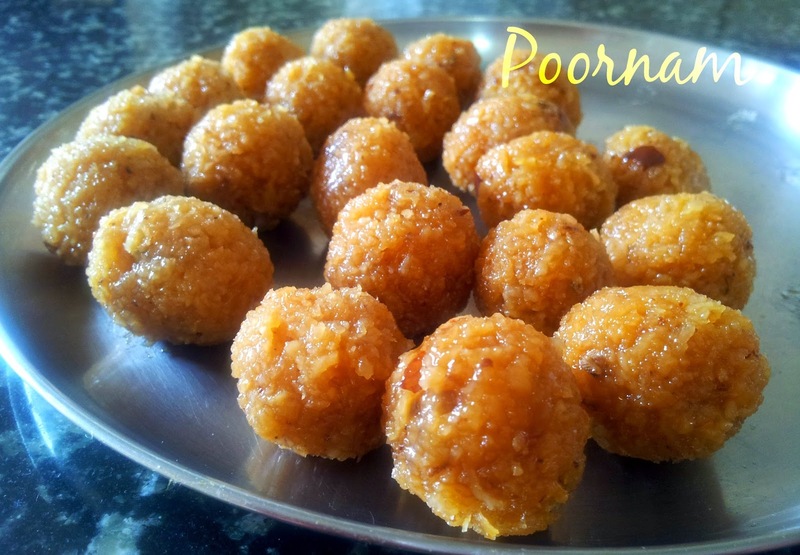 Keep it to cool and make poornam balls. Meanwhile, boil water in a steamer. 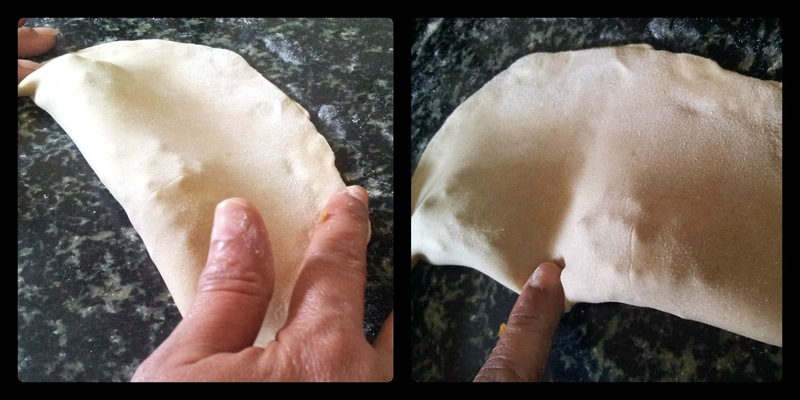 Make small cups out of the dough, place the poornam inside the dough and shape it as shown in the figure. 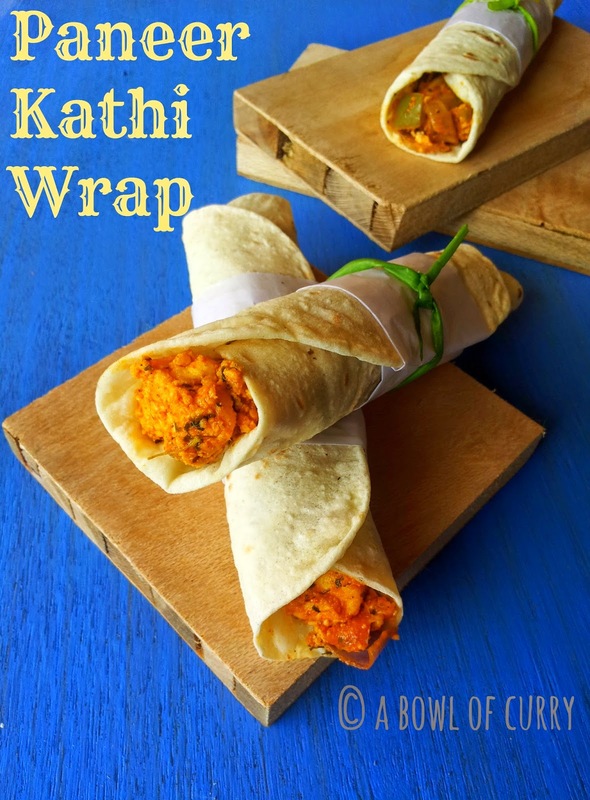 Repeat and finish the kozhukattais and keep covered until steaming. 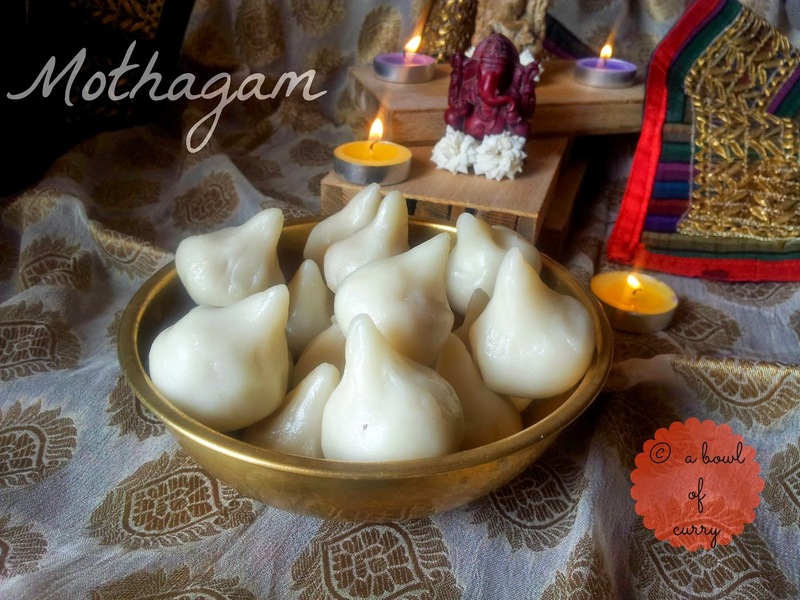 Arrange the mothagams on the steaming plate and cook for 20 - 25 minutes. Or until they are cooked. When cooked you will see that the mothagams are a little shiny on the outside.